Jake Haener won’t read this for a reason. 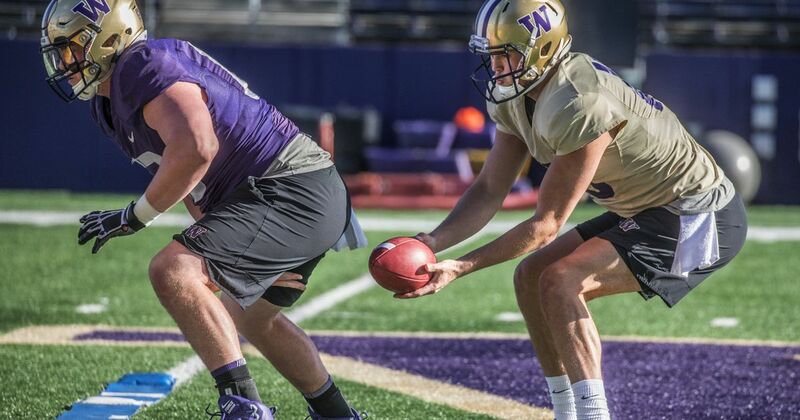 But will that help the UW Huskies QB win a starting job? 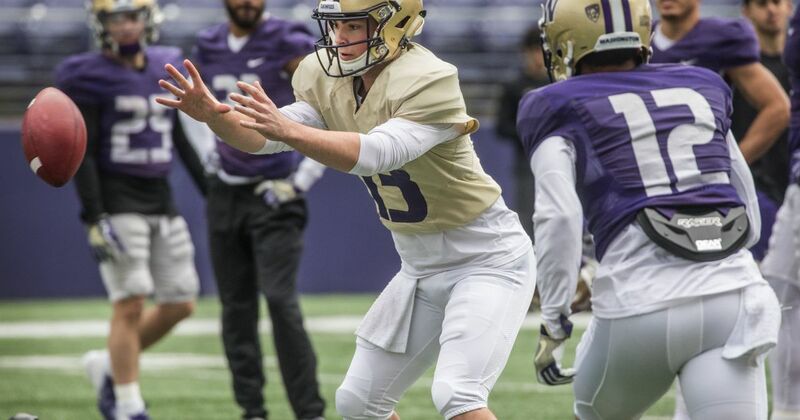 Jake Haener understands that he's the underdog in Washington's ongoing quarterback competition, but the sophomore deleted his social media accounts in order to fully focus on the task ahead. 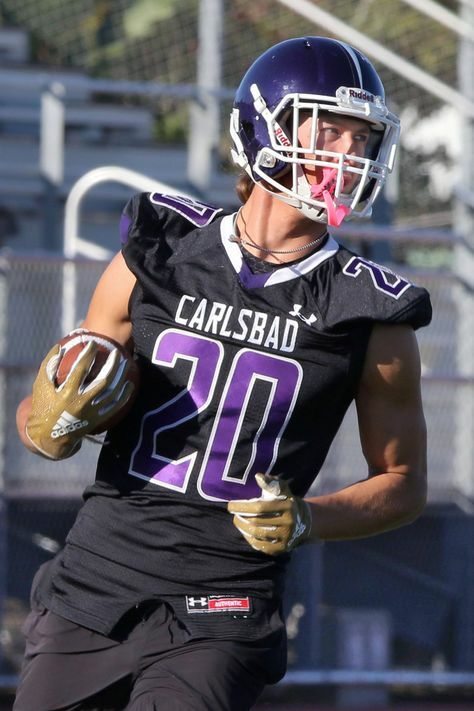 One quarterback excelled while another struggled on Wednesday, and defensive coordinator Jimmy Lake unveiled another new starting safety tandem. 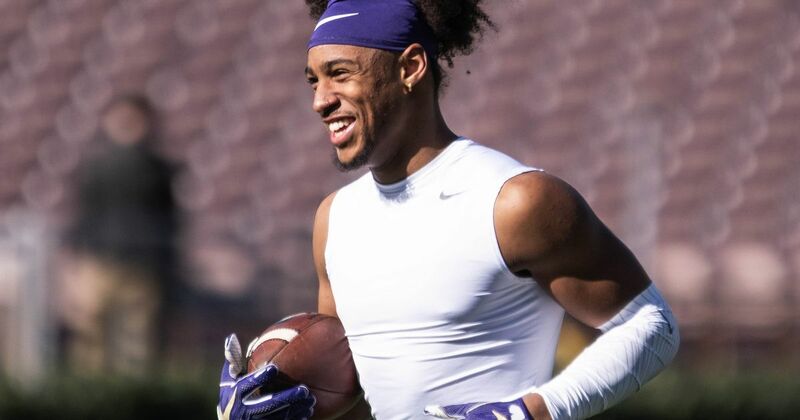 This week, four defensive backs could be selected from UW for the first time in the same draft — Byron Murphy, Taylor Rapp, Jordan Miller and JoJo McIntosh. 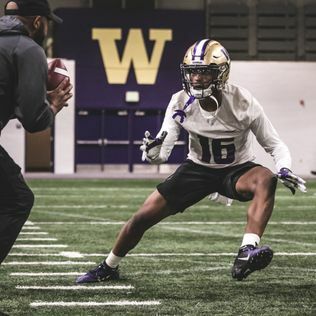 Following Monday's practice, Washington defensive coordinator Jimmy Lake spoke with the media about cornerback Keith Taylor's next step, the ongoing safety competition and how UW's coaches and players can benefit from Saturday's Spring Preview. 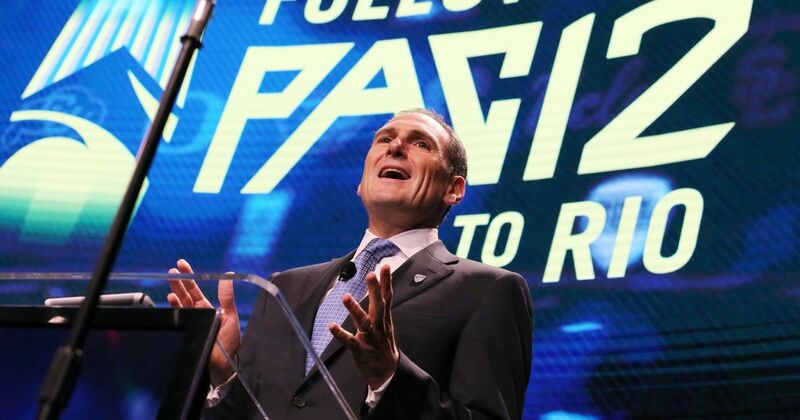 Internal budget projections for the Pac-12 Networks obtained by the Hotline show a 6% ($8.1 million) year-over-year decline in total revenue and, perhaps most significantly, they aren’t expected to increase the amount they distribute to the campuses. One NFL talent evaluator said Browning’s arm strength was a “major concern” coming out of college. That same evaluator watched Browning cat the NFL combine. “I did a double take,” the scout said. “I thought, ‘This doesn’t look like the same kid.’ "
The Huskies senior allowed one base runner via a walk. She retired the first 17 batters she faced in notching her 20th victory against four defeats. She had 13 strikeouts. Cameron Williams considered himself primarily a quarterback throughout his first three seasons at Bakersfield (Calif.) High School. 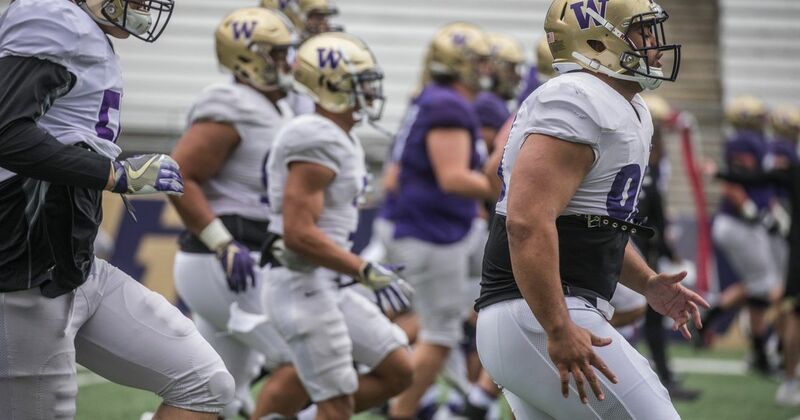 Now the early enrollee freshman safety is ascending the depth chart at Washington during his first spring on campus. Wide receiver Andre Baccellia made perhaps the premier offensive play of the spring and an early enrollee cracked the starting lineup. The ranking is based partly on observed talent and playmaking, but also on the role injuries and/or coaching played in performance and the value of the position in the NFL. 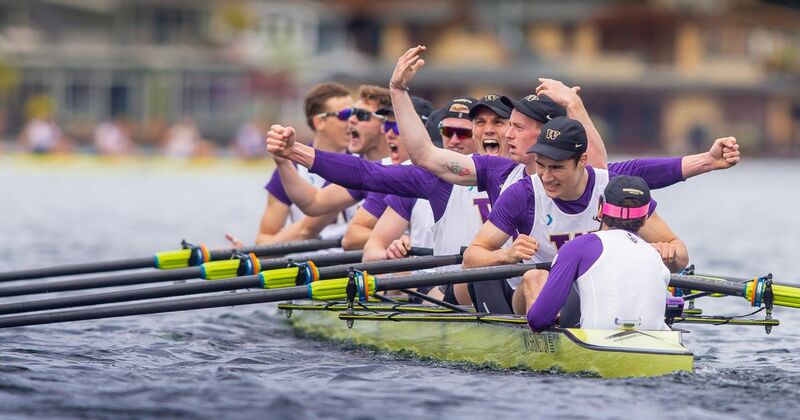 The second-ranked UW varsity eight overcame an early a six-seat deficit to rally for an impressive boat-length victory over No. 4 California. The third-ranked Washington softball team beat host Utah 11-2 for their 16th consecutive victory. 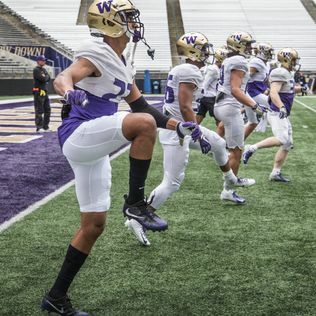 A background in competitive dance and kung fu, among other things, contributed to redshirt freshman cornerback Kyler Gordon's unique athletic package. Now Gordon's goal is to crack the starting rotation in Washington's deep defensive secondary. Growing up, Taylor Rapp couldn't flip on Sunday Night Football and see players who shared his heritage taking the field. 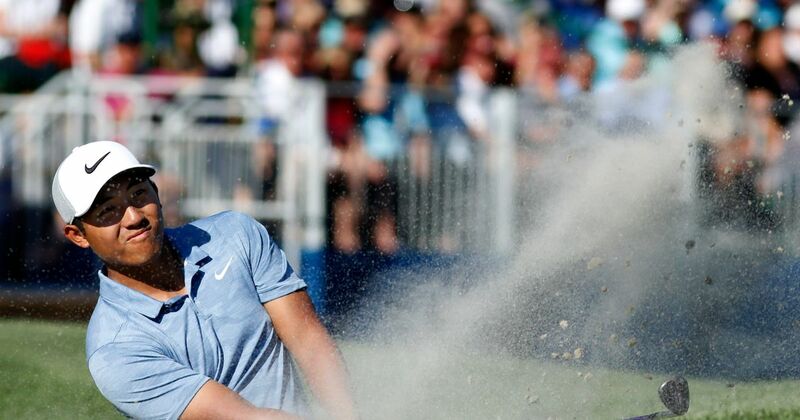 While playing pro ball has been a dream for Rapp, he wants to be more than just a player. Washington safety signee Asa Turner ultimately chose the Huskies over Notre Dame both because of the position he decided to play and the coach who believed that he could play it. Now, it's time for Turner to prove that he made the right decision. 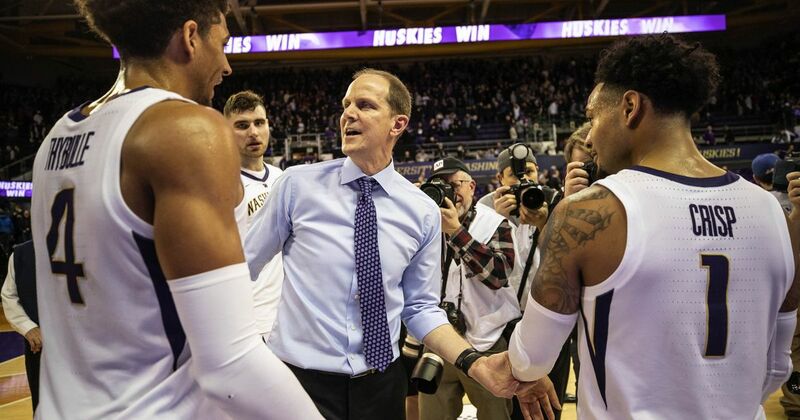 The Huskies were humiliated 88-66 by then-No.11 Auburn last November in the first-ever meeting between the teams. 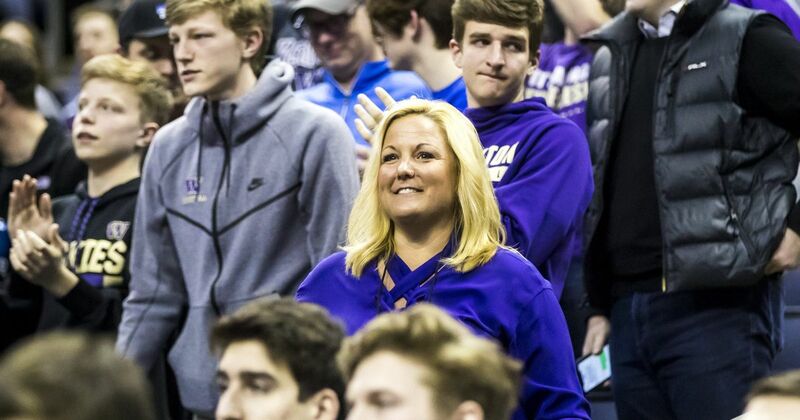 Washington athletic director Jennifer Cohen received a 63 percent raise in annual base salary — from $460,000 to $750,000 — and a three-year extension in August 2018, The Times learned this week. That includes a two-year option that would run through May 31, 2026. 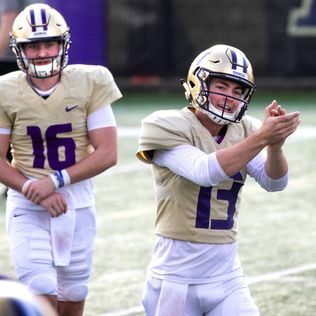 Jake Haener and Jacob Eason were solid but unspectacular Wednesday, as they continued to split first-team snaps in the competition to become the Huskies' starting quarterback. LINCOLN, Neb. (AP) — Bill Moos has rolled with the punches. Now he is just on a roll. Nebraska's 68-year-old athletic director has pulled off two of the splashiest hires in college athletics in the 18 months since he arrived, all while batting away criticism for leaving a hefty debt at his previous school and fending off social media rumors that forced the administration to issue a statement of support. "I'm pretty thick-skinned," Moos said in an interview with The Associated Press. "I had an old AD who told me when I got into the business that it's lonely at the top, and it is." Life at the top is pretty good right now. "Bill is delivering exactly what we sat here and said in October of '17," chancellor Ronnie Green said. Flush with unprecedented amounts of cash — Nebraska received a record $50 million distribution from the Big Ten for fiscal year 2018 — Moos has been able to spend what he thinks is necessary to return the school to the upper strata of college football and elevate a long-struggling men's basketball program. "Our brand is not tarnished. It just needed to be dusted off and have a little bit of polish put on it," Moos said. "We have so much to offer here." Moos' first move was to hire football coach Scott Frost away from Central Florida, where he orchestrated a dramatic two-year turnaround resulting in an undefeated 2017 season. Frost is a Nebraska native, and he quarterbacked the Cornhuskers' 1997 national championship team, but bringing him home was no sure thing. Frost was the hottest coach in America at the time and his name was connected to other high-profile openings such as Florida and Tennessee. Moos landed him in December 2017 with a record contract for Nebraska: seven years, $35 million. MINNEAPOLIS (AP) — Chris Beard of Texas Tech had a cheering, boisterous audience as he took stage Thursday to accept the trophy as The Associated Press men's college basketball coach of the year — his players and family filling the front row to celebrate his success as their own. "I don't know what I possibly could have that John Wooden and Bob Knight and (Michigan State coach Tom) Izzo didn't have, but I don't think that they probably had their team — 30 minutes removed from practice — sitting on the front row when we got the award, so this is special," Beard told his players from the stage. "So I want to thank each player that played on this year's team. I wouldn't be here if it wasn't for you guys." The players' presence — full of cheers and even a news conference question from graduate transfer Tariq Owens — was an unusual sight for the annual award presentation. It was also a sign of how the Red Raiders are bonded by their well-traveled coach's work, work, work approach that guided his career on its winding path through obscure, overlooked coaching jobs to the college basketball's biggest stage. "I've always believed you have to be who you are," Beard said in an interview with the AP. "You can never forget who you are. ... Sometimes as you advance in the profession and the logo on your shirt changes or the title next to your name changes, you kind of change. I've never wanted to do that." HOUSTON (AP) — Houston coach Kelvin Sampson has signed a contract extension through the 2024-25 season after helping the Cougars to their best season in 35 years. Sampson took over in Houston for the 2014-15 season and the Cougars won just 13 games. The following year they won 22 games, the most since 2008. They finished with 21 wins in 2017 before taking the next step last season, going 27-8 and making their first NCAA Tournament appearance in eight years. They came one win short of the Sweet Sixteen last season, falling to Michigan on a buzzer-beating 3-pointer by Michigan. Sampson has revived a college career that was derailed by NCAA violations regarding impermissible calls to recruits at both Oklahoma and Indiana. Those violations resulted in a five-year show cause order from the NCAA that kept Sampson, who took Oklahoma to the Final Four in 2002, out of college coaching until he was hired at Houston. 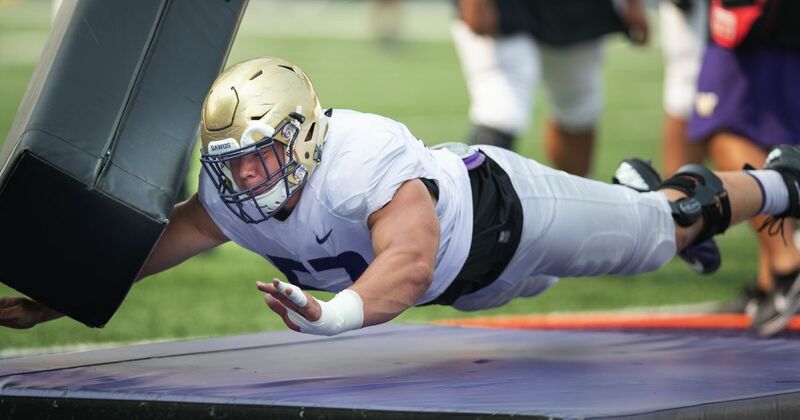 SEATTLE (AP) — Washington's Jacob Eason was arguably the most accomplished scout team quarterback in the country last season. 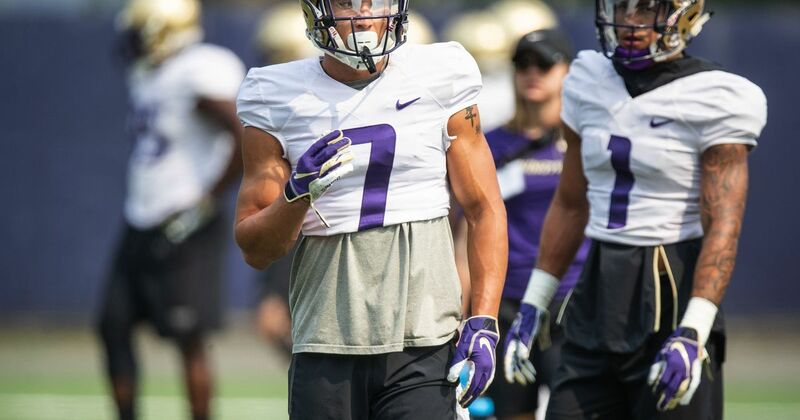 Petersen would prefer there's no hype or attention surrounding Eason, who was relegated to being a spectator at Washington last year. 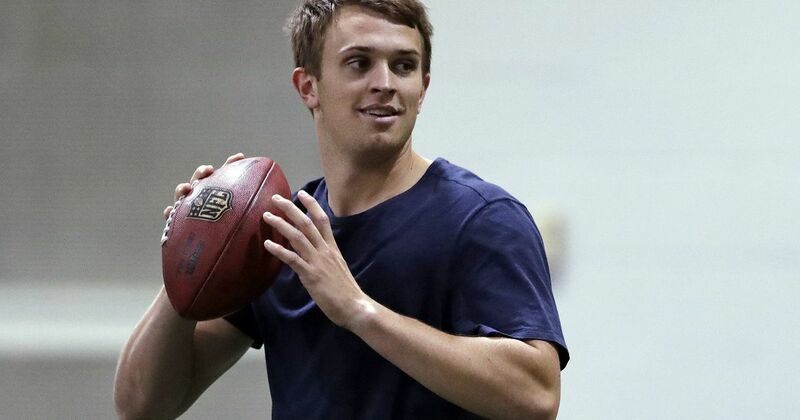 "(Eason) hasn't played real football in a long, long time. That's the thing," Petersen said. "This is a college guy who played one year of college football and I just think it's a disservice to him for you guys to put all this pressure on him. I've seen what is out there and all that kind of stuff. He's a college guy, has played one year of football, got some really good talent. But our other guys do as well, but it's not being talked about like it is with him. I think that's unfair." Eason began his career at Georgia as a freshman starter, but he was unseated a year later by another freshman — Jake Fromm — after suffering an injury. Fromm went on to lead Georgia to the national championship game, and Eason decided to return home and transfer to Washington.